i b i k e l o n d o n: "Smoothing traffic flow"? It's FINISHED - we won the battle for Blackfriars Bridge! "Smoothing traffic flow"? It's FINISHED - we won the battle for Blackfriars Bridge! In 2011 Transport for London proposed to tear the cycle paths out of the north junction of Blackfriars Bridge, increase the lanes for motorised traffic from two to three, increase the speed to 30mph and take out vital pedestrian crossings - all on one of the busiest river crossings in central London where people on bikes make up the majority of all traffic. Cyclists had been killed on the bridge before, and the cycling community's response to Transport for London's plans was unified and unequivocal; if they went ahead then cyclists or pedestrians would be killed there again. Thousands of you signed petitions and added your image to a picture protest wall. Cyclists forced the Mayor of London Boris Johnson (who is Chair of TfL) to state that "more work needs to be done on cycling over Blackfriars Bridge". All of the major parties (including the Conservatives) backed an Assembly motion calling for TfL to retain the existing 20mph speed limit and "revisit the plans for the bridge". Campaigners even discovered that TfL's own safety audit recommended they review their own plans. Protests on Blackfriars Bridge captured the media's attention - and helped to put pressure on TfL and the Mayor. Exhausting all democratic options, cyclists and pedestrians joined forces to demonstrate on the bridge. Called to the streets by myself and fellow blogger Danny Williams from Cyclists In the City, there were three demonstrations on the bridge, each larger than the last. The demonstrations - which saw thousands of cyclists cover the entire bridge as BBC and ITV cameras looked on - were the beginning of a resurgent and more direct force for cycle campaigning in London. The London Cycling Campaign also joined the demonstrations and were overwhelmed by the response their own proposed designs for the bridge received. As a battle ground, Blackfriars became the launch pad for the Love London, Go Dutch campaign and the biggest cycling protest ever seen in London, not to mention more guerrilla campaigns such as Stop Killing Cyclists with their die ins and Bikes Alive with their Kings Cross flashrides. This zeitgeist of protest inspired The Times to be bold in their reaction to one of their own journalists being run over, launching their Cities Fit For Cycling campaign and financing the Get Britain Cycling parliamentary enquiry. And the Mayor, re-elected on the back of the cyclist vote, announced the largest and most comprehensive cycle spending program ever seen in the UK. In short, the battle for Blackfriars Bridge marked a turning point in London cycle campaigning where the space provided for safe cycling was seen as the key to success, as oppose to just the competence of the cyclists who use it (or perceived lack of). And now, two years after those initial heady protests, people power has finally won on Blackfriars Bridge. This week Transport for London announced they will shortly introduce an 18 month experimental traffic order reducing the speed limit to 20mph limit on the bridge, and surrounding roads - one of the protest's key initial demands. Furthermore, the bridge's north junction will now be completely redesigned and reconstructed in order to accommodate a new largely separated north-south cycle route from Elephant and Castle to Kings Cross, which will intersect with the Mayor's east-west "Crossrail for bikes" which is slated for construction later this year. 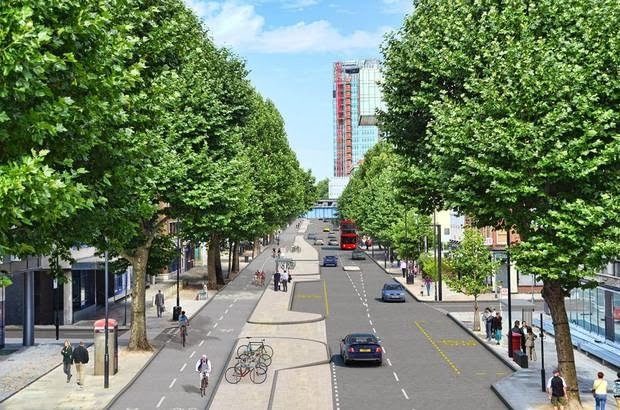 TfL's proposals for Blackfriars Bridge Road - we're not quite there yet, but we're a thousand miles away from the rhetoric of 2011. Whilst we haven't quite yet got to the point where construction is underway, this week's news is nevertheless a highly significant turning point. In 2011 the Mayor stated "...a speed limit of 20 mph isn't necessary and could be a serious impediment to smooth traffic flow". On Blackfriars Bridge we've shown that the 'smoothing traffic flow' arguments simply don't add up, and that people have to be put first. In my opinion, it's a milestone that everyone who wrote letters, signed petitions and protested should be extremely proud of. The 20mph 'test zones' on Blackfriars and London Bridge will join with a larger 20mph zone across the City of London which will be consulted on shortly after being voted for by the Corporation last year; another scheme initially requested by cycling and pedestrian campaigners. In real terms this means that the the authorities are now proposing to make possible exactly what they said was impossible just two years ago. Their old argument that it would disrupt too much the smooth flow of traffic has been an impediment to progress on schemes across London; now the lid of that Pandora's box has been lifted there can be no turning back. In short, it may take a lot of blood, sweat and tears, it may take a long time -and we may have to wait before organisations like TfL are prepared to admit to losing face - but above all campaigning works. It certainly is good news, and I believe it just goes to show that noisy but good natured mass-action achieves more than back-room pretty-pleasing for concessions from DfT. The City of London’s proposal to introduce a 20mph zone across the city is of course not really news anymore, but it is good to see that the Traffic Order is now being promulgated. The 20 proposal emerged from the Local Implementation Plan (for the Mayor’s Transport plan) process a couple of years ago – although of course representations were being made to the City long before that – and the Transport Committee were immediately supportive. It was less obvious that the powerful Policy & Resources Committee, or the full council, would be as supportive, but in the end the vote to adopt the proposal in full council was overwhelmingly in favour, with only a handful of dissenters, who distinguished themselves by their asinine reasons for objection. Of course you always get some such characters in local politics, and although many complain about the undemocratic nature of the City’s governance, I am sure that the lack of Party-Political issues in the Council helped to bring about a common-sense attitude among members. I would however like to highlight a point which is not entirely clear in your post: the consultation process for the Citys 20 scheme has already started and comments must be sent in to the Director of Built Environment “by 18th February 2014”. (http://www.cityoflondon.gov.uk/services/transport-and-streets/traffic-management/Pages/20-mph-speed-limit-proposal.aspx) I think this means that you have to send them in no later than 17th February – I assume postal mail postmarked no later than 17th will meet the deadline. If you follow the link here and click on to “your views on the proposal” you will find yourself reading a formal legal Notice of a proposal to make a Traffic order. In the way of such legal notices they only invite responses from people who wish to object to the proposal. You need not let this deter you from writing in to support the proposal, and I would urge as many people as possible to do just that – there will inevitably be some very noisy and strident objections, from bodies such as the LTDA, the FTA, and possibly some City institutions, so we need to ensure that a balance is maintained. The invitation implies that responses should be sent in the mail to a street address for the Director of Built Environment, however I can see no reason why he should not also receive comments by email. His name is Philip Everett and his email address is Philip.Everett@cityoflondon.gov.uk. In other words, after five years of smoothing traffic flow and with a rebounding economy, road traffic is increasing which is causing congestion. As a dose of reality on a daft policy that's pretty overwhelming - why isn't this increased demand being taken up by buses and cycling, which wouldn't cause congestion? Thanks for both of your superb comments. Paul; I will try to rally the troops re 20mph. Tom; well, that's frankly very telling indeed! Do you think Hendy is on the smoothing traffic flow side of the debate or more interested in space for more efficient forms of transport (including, of course the bus) I get the impression he is politically adept enough to sense whicever way the political will is blowing and to adapt.